This is an excellent ammo option for older Iver Johnson or Smith & Wesson revolvers chambered in .32 S&W as well as for custom rifle projects. Each round is manufactured in the United States using components of distinctive quality which include reloadable brass casings with pronounced rims for proper fit in a cylinder. Each casing is equipped with a clean-sparking Boxer primer and a lead round nose (LRN) projectile. The LRN bullet weighs in at 88 grains and has a curved nose for easy insertion and reloading in any piece. A well-shaped shank gives the bullet good engagement with a revolver's forcing cone and barrel rifling for distinct accuracy. While it's an older concept, naked lead bullets were often used for defensive purposes in order to produce mild expansion at short distances and at low velocities; otherwise, these rounds are well-suited for target practice and plinking. 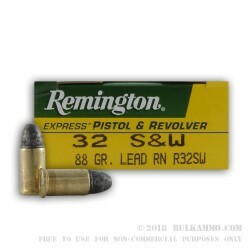 Remington is a well-known American company that has over two centuries of experience under their belt which they use to manufacture high-quality ammunition and firearms for sporting competitions, self-defense purposes, and military operations.